The new Hercules trailer has just hit. It’s what you would expect for a film with Dwayne Johnson in it. Lots of action, not much acting. After watching the trailer, the first thing that springs to mind is how shoddy the CGI effects, and monsters, seem to be – It seems to be most pronounced when the snakes appear… They can’t blame it on “early CGI” syndrome as the film is quite close to release. The other, great, news is that there is a new poster for the film. Yippie! A totally uninspiring, photoshopped to an inch of his life job. It seems that more has been spent on the designer touching up Dwayne than anything else. You can see the conversation when it was almost finished. Someone has said that it neesd something at the bottom & someone just yelled out FIRE!. Then the poster was finished! It only shows Dwayne in close-up with only the director’s name and the film’s title to keep it company. What about the other cast? You know, the ones that can act and have had a long career before this film that didn’t involve wrestling, sorry, Sports Entertainment. On the plus side, Dwayne has put in the work and got back into the same sort of shape he was in before he started doing, quite dire, children’s films. The film is coming out, as well, in 3D and IMAX versions. Not for the extra money that this will generate, honest 😉 As you are aware, I’m not the biggest fan of 3D in films. Sometimes it works. IT has to be used well. In this case I can see spears and the old clichés coming out that was the bane of 80s 3D and lazy horror directors. 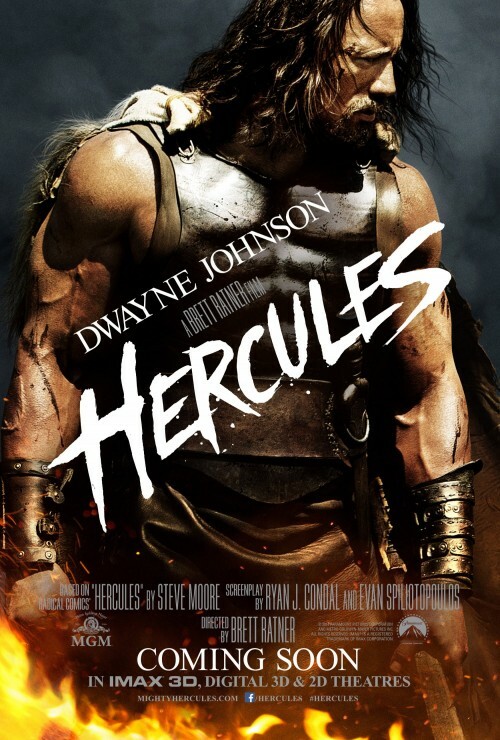 Paramount and Metro-Goldwyn-Mayer Pictures’ film HERCULES, starring Dwayne Johnson, bows on July 25. Based on Radical Comics’ ‘Hercules’, this ensemble-action film, featuring an international cast, is a revisionist take on the classic myth set in a grounded world where the supernatural does not exist.